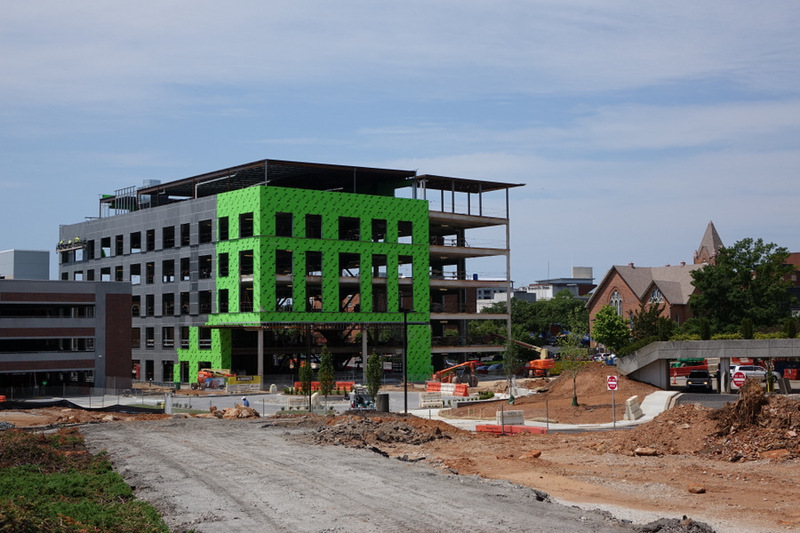 This building under construction for Erwin Penland resides in what will become a new city identity zone: “North of Broad” – an area between East Broad Street and McBee Avenue. The surroundings will be pedestrian friendly and are hoped to draw several more businesses to nearby buildings. The green layer is only the first insulation layer of a LEED silver certified energy efficient office and mixed-use building, and the final outside layer will be more conventional. A new “Big Belly” solar powered trash compactor set for trash and recyclables has been installed in Cleveland Park. It can hold up to 5 times the amount of trash as conventional receptacles. They include wireless data reporting which alert when full, which results in fewer trips needed to check and pick up trash by city workers. A group of electric vehicles came into Greenville over the weekend on their way to enter the Guiness Book of World Records for the longest trip in an electric car, an electric scooter, and an electric motorcycle. The Ride the Future Tour also includes electric bicycles. They were delayed by the rainy weather and did not make it to downtown Greenville. I was able to sign the witness book which will be used as proof of the trip. 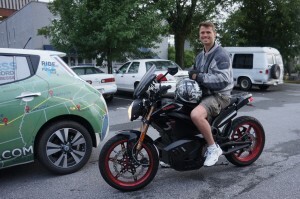 Ben owns 2 electric vehicles: the Zero motorcycle in this photo, as well as an electric car. He is a Physics teacher, and a swing dancer. Duane plugs in the Nissan Leaf at County Square for a recharge. There are 2 cars in the Poinsett parking garage that are part of the WeCar car rental program. 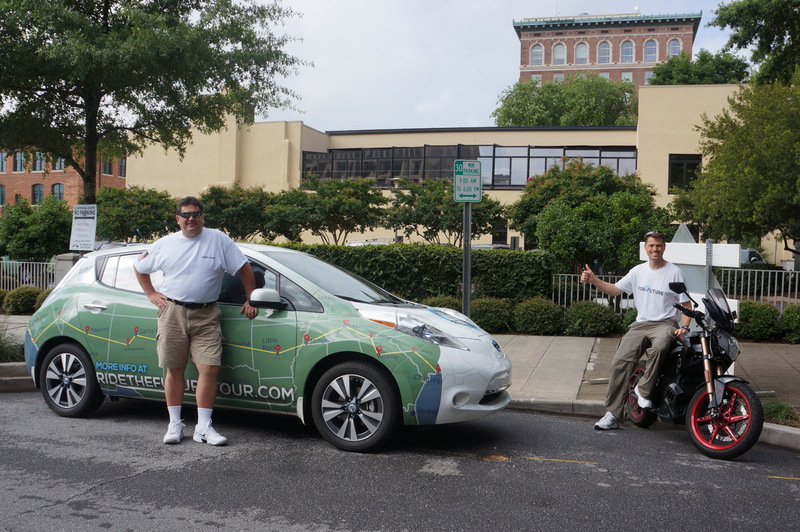 Â There is an all electric Nissan Leaf shown here, as well as a Chevy Volt on the right. Â They are available to rent by the hour, the day or overnight. 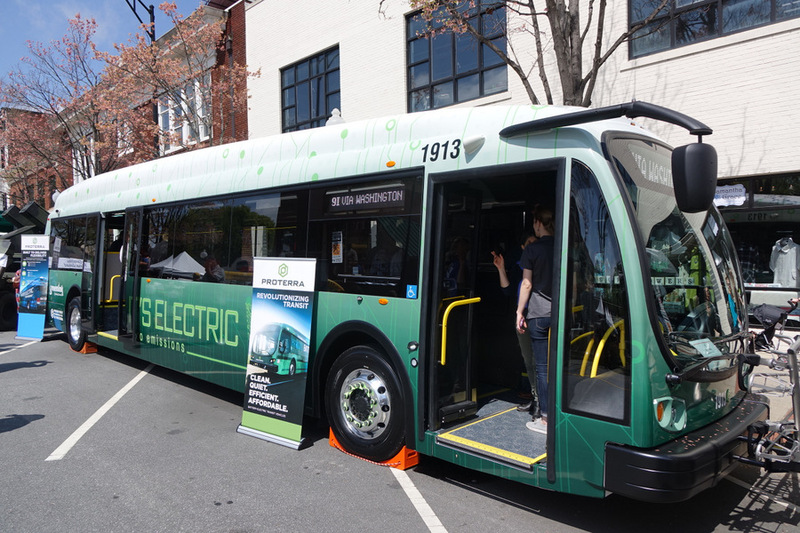 The all electric Zero Emission Â EcoRide demo bus from the local manufacturer Proterra was spotted in downtown Greenville. Â Â Although electric buses have a very good payback through lower energy and maintenance costs, the purchase price is still higher than diesel buses. Â The local Greenlink system would like to add some of these buses, but the funding is not available. Â Â The nearby Clemson CAT bus system will be getting four of these buses in the future. 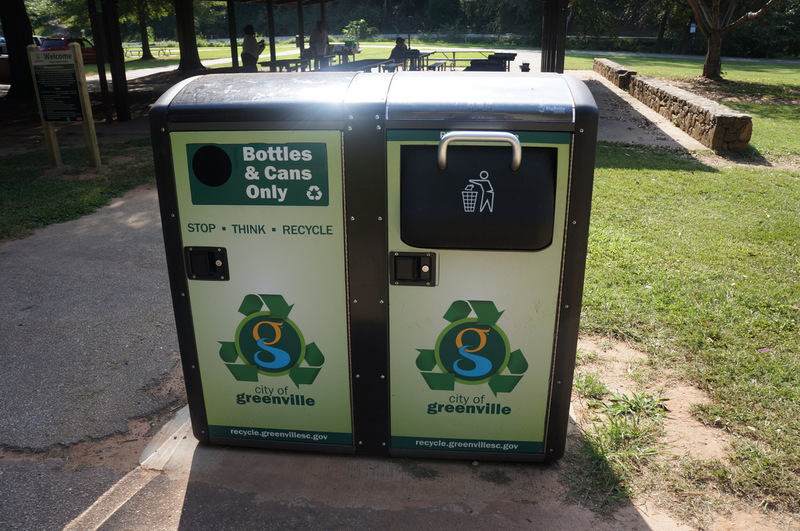 Last year, the electric vehicle charging station at the Greenville Zoo made the list of theÂ 21 Coolest spots in America to charge your vehicle. 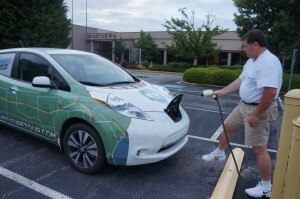 Â Here Leslie is using the charging station for an all-electric Nissan Leaf to charge. The EV Ecosystem now has more than 40 vehicle charging stations installed throughout Greenville County. Some of the new LED street lights have been installed on the Hyatt block of North Main Street as part of the LED Streetlight Project. Â They are constructed so that nearly all the light is directed downward, to spare theÂ Roper Mountain Science Center from glare in the night sky as they try to use the telescope. Â Just between you, me, and the Lamp Post, I like the look of the lights and the quality of the light at night – it is white and not tinted green as the previous lights were. A set of obsolete street lighting awaits removal as the lighting on the Hyatt block of North Main Street is being upgraded to more efficientÂ LED lighting. Today’s photo shows another transportation alternative in downtown Greenville. I especially like the name of the company, Greenerville. Naturally, I also like the idea behind the company … Their website says “ride in what we think will be a common mode of transportation in the near future”. PS: Over the next several weeks readers will see banners, in my sidebar, sharing information about the The Youth Economic Summit which will be held October 24th through the 26th here in Greenville. If you are between the age of 14 and 18 then check it out and if interested fill out an application. If you are a little older, like me (smile), then consider becoming a sponsor. PPS: An at-a-boy goes to Red Hype for creating a very interesting and interactive website for YES.